When a proud nobleman refuses to kiss the hand of the despotic King James in 1690, he is cruelly executed. 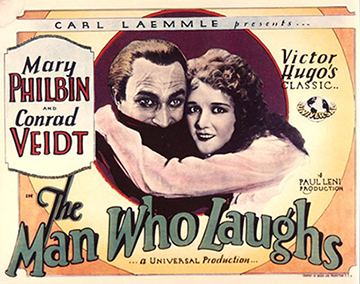 His son (virtuously played by Conrad Veidt) is then surgically disfigured to always smile with a hideous grin. One of the final treasures of German silent Expressionism, forgotten for many years, this masterpiece is slowly being rediscovered as the film that is credited for the inspiration of the Joker character from Batman. The film is an adaptation of Victor Hugo’s melodramatic story, yet it so steeped in expressionist gloom that it plays like a horror film. The music will capture the 17th century backdrop of the story with improvised baroque music, exhilarating to realms of contemporary music and sheer ambient sound, to accommodate the dark-modern undertones of the film. The Scroll Ensemble is a unique ensemble with Early Music as its starting point for exhilirating improvisations. From there they move within the realm of the contemporary world, from dance to jam session, from film music to classical concert, from outdoors troubadours to the most intimate theatrical gesture. 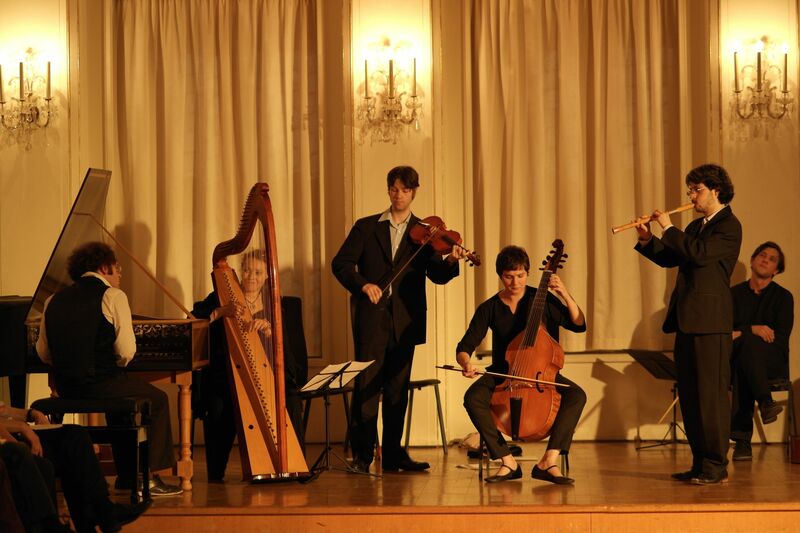 The ensemble wishes to return to the freshness, spontaneity and freedom of early music. They were selected by Belgian I​YAP as 'promising early music ensemble' in 2014 and in 2015 they have been selected to compete in the finals of the Y​ork Early Music International Artist Competition ​(July 2015). In the past they have performed for Queen Beatrix of the Netherlands, with Christina Pluhar for the A​EC,​in the Leipzig Improvisationsfestival (next to William Dongois and Paolo Pandolfo) and are the regular ensemble for Rachel Farr’s dancing lessons at the Utrecht Early Music Festival. Furthermore they improvised in the cinema film Michiel de Rutyer (NL, 2015, featuring a.o. Charles Dance) and taught improvisation in Brazil, Mexico, Poland and the Netherlands. The ensemble consists of James Hewitt (violin), Robert de Bree (recorders & oboes) and Iason Marmaras (keyboard & voice). They regularly work with special guests: Sarah Ridy (harp), Florencia Bardavid (gamba), Marcin Swiatkiewicz (keyboard), Bert Mooiman (keyboard) and Patrick Ayrton (keyboard). Festival for silent film and live music revives a tradition, exhibiting the enduring relevancy of silent films with the accompaniment of contemporary music, composed and performed by contemporary artists that give a fresh perspective to early cinema masterpieces. This year Sounds of Silence is celebrating its 4th edition. The festival takes place in the Theater De Nieuwe Regentes, The Hague, during the weekend of 9-11 March, 2018.